It seems that Microsoft is burying the hatchet with Apple. Well, that’s the advertising campaign anyway. Microsoft’s “Microsoft spreads the spirit of the reason on 5th Ave” advertisement is just under two minutes of peace, love and people wearing Microsoft t-shirts singing at the Apple Store on 5th Avenue. While this ad is obviously designed to go viral and to be a talking point on morning talk shows, it may actually signal a bigger movement that’s happening beneath the surface of this age-old fight between Microsoft and Apple. If you can’t be bothered to take the time to watch the video, here’s a quick run-down. First, we get shots of people playing with Microsoft’s latest Surface tablet… er, I mean laptop… er, I mean halfsy, hybrid device. Suddenly, there’s a mass exodus and the people walk outside and up 5th Avenue. Text appears that explains that on November 16, 2016, the employees at the Microsoft Store delivered a “special message to some old friends.” The people continue to walk down the street for a bit, and then you get a glimpse of the Apple Store. Suddenly, all the Microsoft people and a local New York City children’s youth choir are holding candles and standing outside the Apple Store. Then, they start singing “Let There Be Peace On Earth.” The Apple people file out the store and look rather touched. Then, the Microsoft people and the Apple people hug it out. Sound weird right? It was a little weird, but burying the hatchet is probably the best idea for these two tech veterans. The feud between Microsoft and Apple is one of legend. It reaches far back to the very beginnings of the personal computer. At times, it has really been a heated back-and-forth between the two companies. There’s a long and complicated history behind the conflict between Microsoft and Apple that I won’t get into here, but if you were around during the 80s, 90s and early 2000s, you probably know the highlights. Headed by Steve Jobs and Bill Gates, these two companies were always on a collision course. Their personalities were too big to be part of the same discussion. 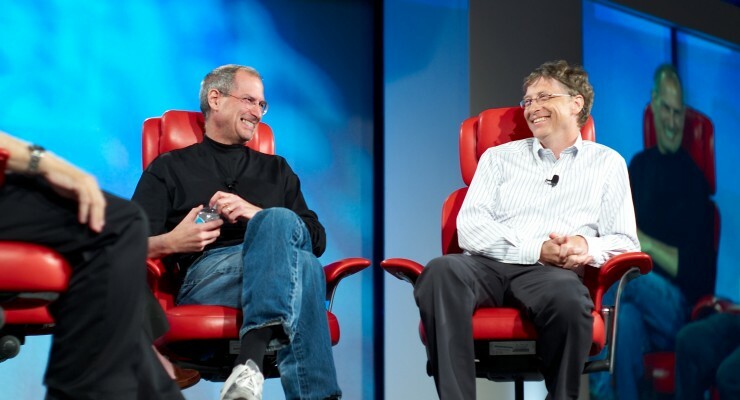 Even though Gates isn’t as charismatic as Jobs, he is just as much a pop culture icon as Jobs, and that makes it easy for people to get invested in the feud. For years, Apple fanned the flames. 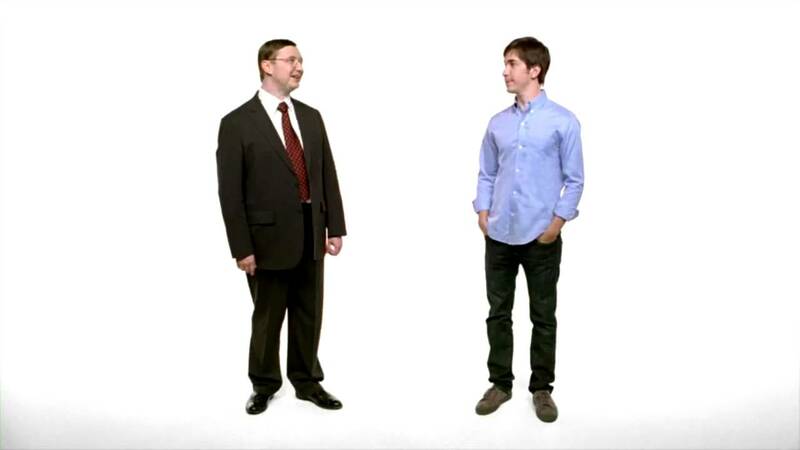 Remember Apple’s “Get a Mac” TV ad campaign? With the not-so-funny Justin Long and the hilariously funny John Â Hodgman? Sure you do. The ad campaign makes it look the competition was all in good fun, but for the people who aligned with either Microsoft or Apple, it was a very serious commitment. You’d be forgiven for thinking that Microsoft and Apple are competing even more directly than ever before. In some respects, that’s true. Microsoft has finally entered the hardware business and is building software specifically for the hardware its creating. Additionally, Microsoft’s hardware is an all-in-one machine that (after several generations) can more or less compete with Apple’s MacBook, iPad and iPad Pro. Additionally, Microsoft is beginning to build its own ecosystem, and it’s reminiscent of Apple’s. Surely, it will take time, but before long, Microsoft users will be as tied to Microsoft as Apple users are tied to Apple products. However, competing for the hearts and minds of consumers with hardware and software is really a thing of the past. Sure, people will always need to buy a piece of hardware that gives them access to the internet, but the fight is really for what they do once they get on the internet. Amazon and Google make hardware, but they have other concerns. For Amazon, the company wants to be in control of your shopping cart, ranging from digital downloads to physical purchases. In many ways, Google offers the same thing, albeit through third-party vendors. Google wants to control the way we see the world — through search engines. For Microsoft and Apple, they’re losing ground to corporations like Google and Amazon. It’s not enough to simply make the hardware; Microsoft and Apple need to stop beating each other up and focus on how to compete with companies who can make cheap but generally satisfactory hardware, threatening to squeeze out Microsoft and Apple’s casual customers. Burying the hatchet and finding a way to compete with Google, the king of search engines, and Amazon, the Walmart of the internet, seems like the best bet for these aging companies. The future isn’t in hardware — it’s having an impact on the way people us the web, and that’s going to take some rethinking. In short, Microsoft’s new commercial is a little hokey. It is a little sappy. But it’s also pointing out something that should be dreadfully obvious: this is no longer a battle between Microsoft and Apple. What do you think about this feud between Microsoft and Apple? Should the two companies be burying the hatchet, or should the battle keep waging on? Let us know in the comments below.